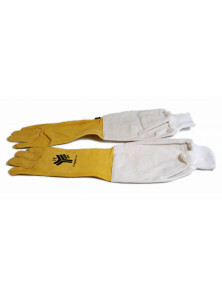 Since 1986 we deal with beekeeping, beekeeping equipment and beehive products, as well as a wide range of foods and natural products. We have a joinery for the production of beehives and all wooden equipment, we make models for individual needs, a plant for the transformation of raw wax into melted wax sheets. 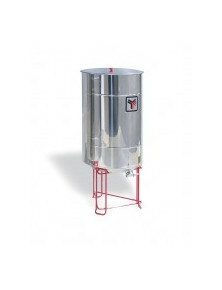 Apicoltura.com is a wholesaler and retailer of the entire range of equipment of the major national and international companies in the beekeeping sector. 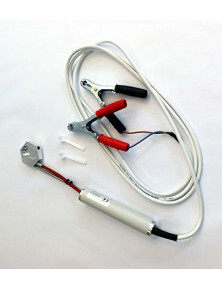 “Minnie W” electronic dispenser with capacitive micro. 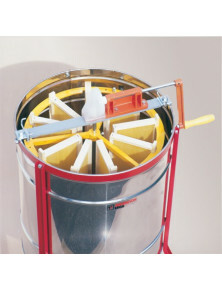 This machine is fitted with an electric motor-driven rotary loader to automatically handle jars to the filling station. Height can be adjusted according to jar dimensions. A digital control allows easily adjusting the dispensed quantity between 0 and 9999 g. The dispensing precision is ±3 g and the production rate is 350 jars/hour (for 500g jars). 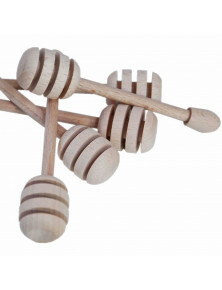 The honey dipper is made of beech wood. 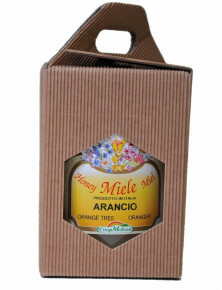 It can be used to spread honey and to decorate the package. 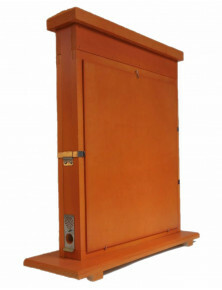 This is an hand-made object produced by Italian craftsmen. This special cage confines the queen bee, thus blocking egg laying for a long period without jeopardising her health condition. 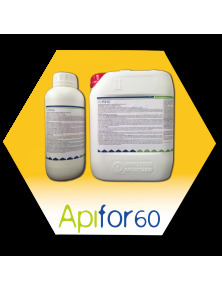 This system allows effective treatments against varroa mites. 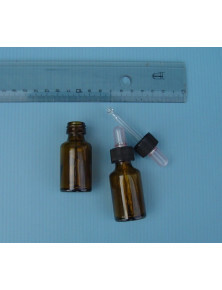 Dropper for dark yellow 20 ml bottle, with 18 mouth. 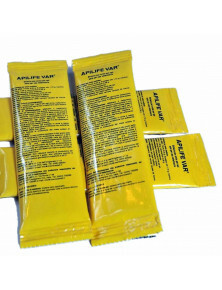 The picture also shows the bottle, which is not included in the price. 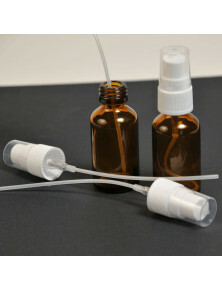 Dropper for dark yellow 30 ml bottle, with 18 mouth. 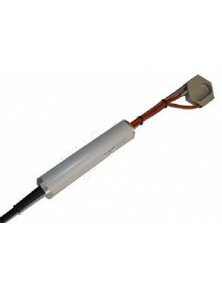 The picture also shows the bottle, which is not included in the price. Erogatore da 5/10 ml di ossalico, Probee e di altri prodotti liquidi da somministrare nell'arnia. 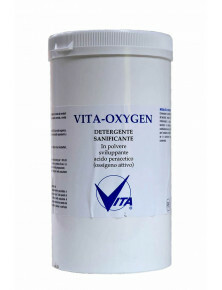 Completo di bottiglia e di tubo di collegamento. 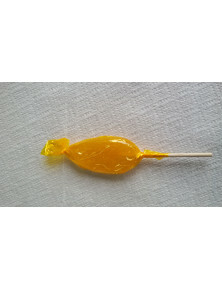 Candy filled with honey, wrapped singolarment. 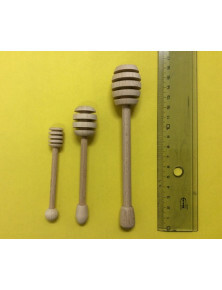 Wooden honey dipper 11 cm. 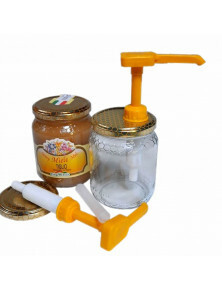 This dripper can be used to spread honey and to decorate gift boxes. 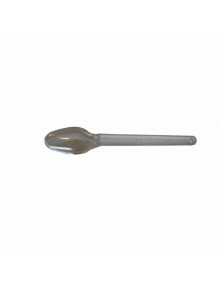 The beech wood dripper is made up of a handle and equally-spaced concentric grooves. Dimensions: approx. 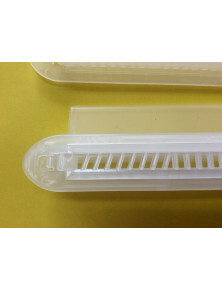 11 cm of length; approx. 2.2 cm of head diameter. 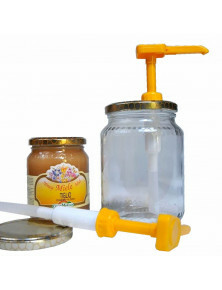 Liquid honey dispenser for jars, with two caps. 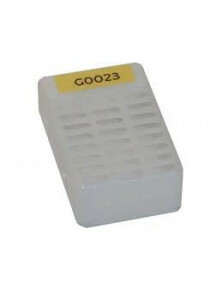 The 70-diameter twist-off cap is suitable for 500 g jars and the 82 diameter one for 1000 g jars. 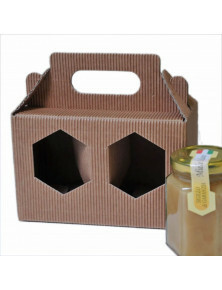 The dispenser can be used only with liquid honey. 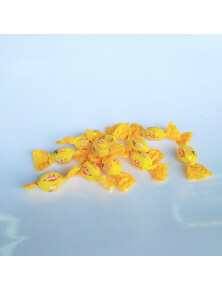 In case of crystallised honey, it must be melted in a bain-marie without exceeding 40°. 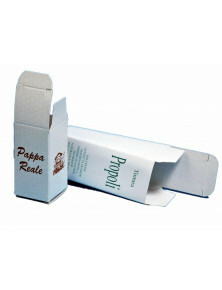 Cardboard box to package the propolis into 10/15/20 ml bottles. 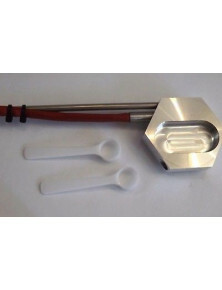 A honey dipper is a tool used to take honey from a jar and spread it. It is made of beechwood. 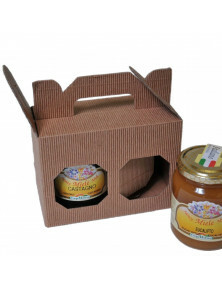 Used to spread honey as well as to decorate packs. It is a precious item, manufactured by woodcarvers, rigorously "made in Italy". 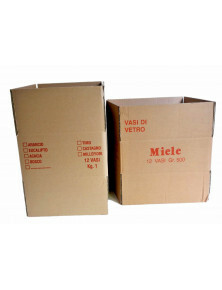 Strong corrugated cardboard box for 12 500g glass jars. Inner dimensions: 34x25x12(h) cm. 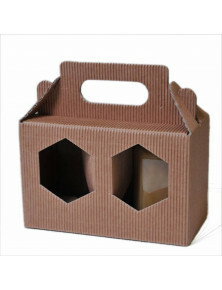 Micro-corrugated cardboard gift box for 2 500g jars, brown. 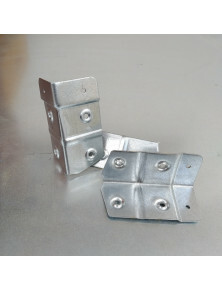 Metal corner joint for hive to connect the brood nest and the super. 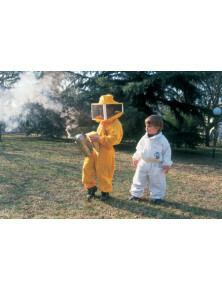 It is advisable to use 3 joints for each hive, two in the front and one in the back of the hive brood nest. The fourth corner (free) is used to allow the insertion of the hive tool when it is necessary to raise the crown board (or the super). 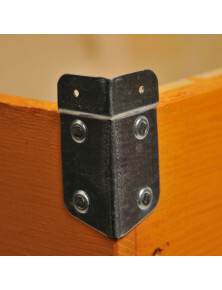 A tool-rest joint may be inserted in the fourth corner to prevent the hive tool from damaging the wood. 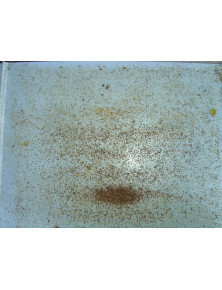 11 g Api Life Var evaporating tablets, for the control of varroa. 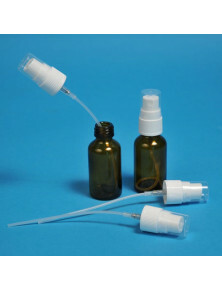 Spray unit to be fitted on 10, 15, 20, 30 and 50 ml propolis bottles. 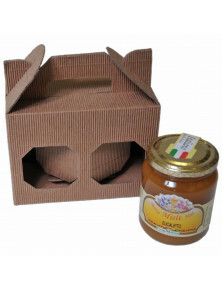 Gift box with 1 jars 500 g jars. 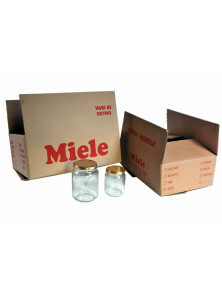 Gift box with 2 250g jars. Total discharge 250 kg “ZERO” ripener. 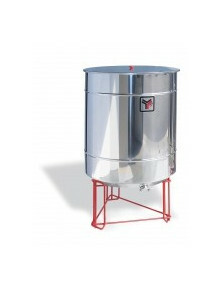 This ripener is made of mirror-polished AISI 304 stainless steel, with total discharge cone-shaped bottom and stainless steel bush for the tap. 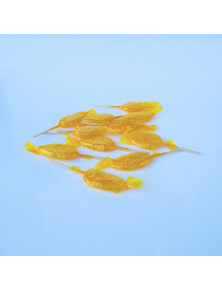 Ripeners are TIG welded to meet all the requirements for foodstuff products. 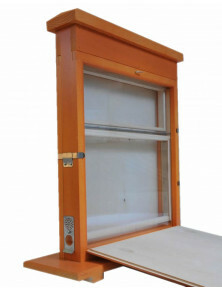 Glass observation hive, Dadand Blatt size, with 1 brood frame and 1 super frame. 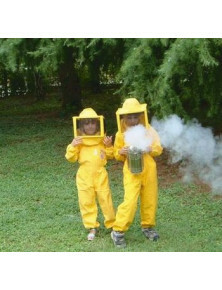 Especially suited for educational purposes. 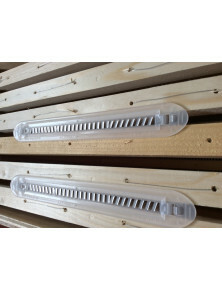 Plastic trap to catch and control the infestation of Aethina Tumida in the beehive. 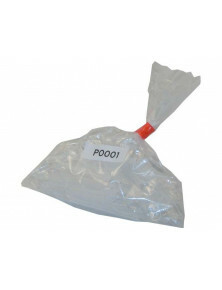 Unlike traditional traps, this trap can be opened to be examined and cleaned. AETHINA STOP is the solution to fight the coleopter arrived in Italy in 2014 and spread from the region Calabria to the rest of the national territory, thus causing serious problems. 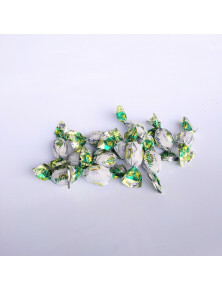 The version WITH ESSENCE can only be purchased in the 25-pcs packet. Professional product. Made in Italy. 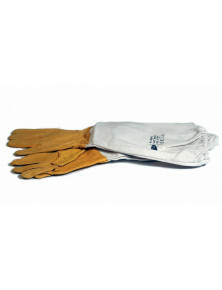 Children coverall "Compatta" with square or round veil, made of yellow cotton, with elasticated wrist and ankle cuffs, full front zipper and large pockets. The S size is suitable for 5-6 years-old children; the M size for 7-8 years-old children and the L size for 10-12 years-old children. 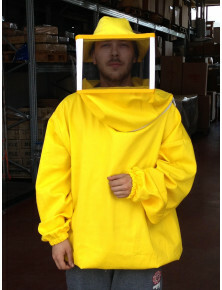 For the disinfection of all beehive pathogens (American and European foul brood, nosema ceranae, chalk brood, varroa-connected viruses), hives, combs and any kind of beekeeping materials.